If you have ever fancied Russian women for dating or long-term relationships, our online dating web service is a place to be. We provide our users with rapidly growing database which include thousands of Russian women. The purpose of our website is to keep singles in touch with each other. Whether you are young or old, you will definitely find somebody who would meet all your criteria and expectations. 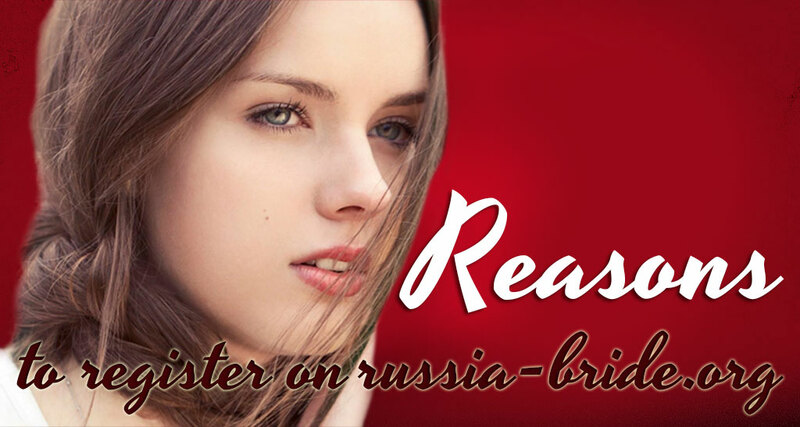 Register at Russia-bride.org for free or visit our fan page on Facebook https://www.facebook.com/RussianBridesforMarriage/ . For ages Russian women have been a definition of a perfect girlfriend, wife and soulmate. Combining high intelligence with gorgeous looks, Russian women can satisfy most sophisticated tastes of men from all over the world. Russian Brides have been famous for a combination of sharp mind, handsomeness and appetite body shape. Don’t miss the opportunity to crack eternal enigma of Russian beauties. Russian women are perfectly shaped and physically fit. There is no need for any Russian woman to spend hours in fitness because their natural physical shape is immaculate. Curved, “hourglass” figure is an attribute of any Russian woman. Slavic beauties also age very well and are able to preserve their body shapes. Russian women are devoted to family and children. You just cannot possibly imagine your future Russian wife would ever argue with you who have to cook dinner or who is in charge of keeping your household clean. Russian women have strong personality. Russian fragile beauties show unusual strength and decisiveness when it comes to issues in their lives. Therefore, they tend to seek those men who are matching their strength and stature. In fact, they are looking for those who are even stronger than they are. Russian women love to absorb different cultures, learn foreign languages and travel abroad. If you are foreign to Russian culture and language, it is not necessary to speak perfect Russian in order to engage in short-term or long-term relationships with Russian woman. They would die to speak your language with you, especially if this is a language with a touch of romance. Russian women are excellent cooks. You have probably heard about famous “bliny”, and “borscht”. There are good news for you: any Russian woman is able to prepare these and a lot of other delicious dishes. Russian cuisine is famous all over the world and you will be happy to be subjected to it while engaging in long-term relationships with a Russian woman. Team of trained experts is checking all the incoming subscriptions to our online dating webservice. We cannot possibly check the actual age of webservice users and cannot guarantee that any person is of proper age. Subscriptions are received from women who claim to be of age 18 or higher. Please inform our website team should you suspect any person is being underaged. Please inform security service of our website if you notice any activity considered illegal. Beware of scam while using our dating website. We are carefully examining every suspicious incoming profile. Should you suspect the user you are communicating with is a scammer, inform our support team immediately. Stop messaging with owners of suspicious profiles. Our moderators check all the complaints and report users back in case there is a scamming activity.